I love wintery comfort foods when the weather starts to turn cold. 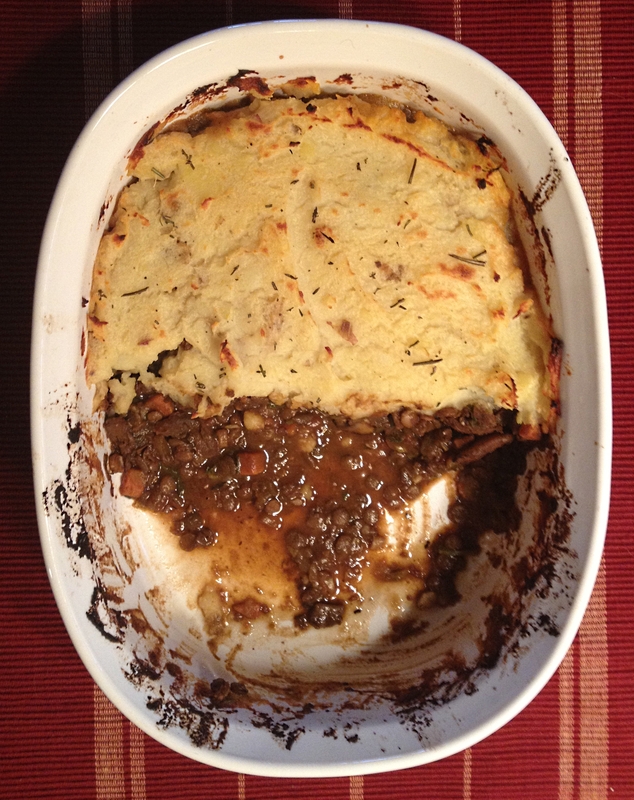 This shepard’s pie is so meaty, you may be surprised that it is completely vegan. (And you don’t have to tell people that it is if they are adverse to the v-word. They’ll never know . . .). The meatiness of the dish comes from a combination of lentils and fresh and dried mushrooms, as well as a good “beefy” vegetable broth. I highly recommend the vegetarian broth bases made by Superior Touch. They make both a “Not Beef” and a “Not Chicken” that are excellent. I used the “beef” in the lentil and mushroom mixture and the “chicken” in the potato and parsnip mixture. Although the dish does take some time to prepare, it’s fairly flexible and forgiving. You could make it with different varieties of mushrooms and different herbs and spices to suit your taste. You can also add more parsnips to the topping or remove them altogether. I love the addition of the parsnips to the mashed potatoes, they add both a richness and flavor. I made this on a Saturday night, and just as it was almost done baking, the power went out. We ate this by candlelight, which suited the dish perfectly. I wasn’t able to get a decent picture of it given my lighting constraints, so I took a picture of the leftovers the next morning. Rich and meaty, you would never guess this is vegan. A significantly healthier and more humane alternative to the original dish that is just as tasty. When all mushrooms are browned, season with salt and pepper and set aside. Heat 2 TBSP of margarine in a deep dutch oven, or soup pot. Add onions, carrots, and celery and saute until moisture is released and vegetables are just beginning to brown. Add salt, pepper, and herbs de provance and cook for another minute. Clear an area in the pot and add tomato paste and cook for ~2 more minutes until tomato paste is beginning to brown. Add lentils, dried mushrooms, bay leaf and ~3 cups of broth to pot and bring to a simmer. Simmer, covered for ~1 hour, stirring frequently and adding more broth as needed. 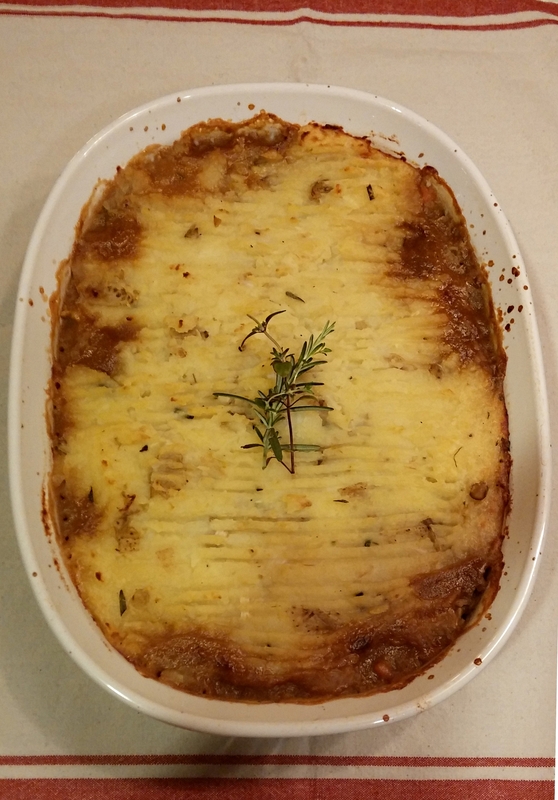 While lentils are cooking, make potato and parsnip topping and preheat oven to 400 degrees to prepare for baking the dish. Add potato pieces to a pot of salted, room temperature water and bring to a boil. In a separate pot of salted water, add the parsnip pieces and bring to a boil. When potatos and parsnips are softened and can easily be pierced with a knife, drain them and combine them in a single pot. Add butter, roasted garlic (peel it from the skin), rosemary and thyme and mash to combine. Add broth or non-dairy milk a little at a time until the desired consistency for mashed potatoes is reached. When lentils are cooked, add 1/2 cup of red wine to pot and cook for another 2-3 minutes. Check the consistency of the lentil and mushroom mixture. It should be a very thick stew. If it is too thin, you can cook longer, uncovered to thicken it, or mix 1 TBSP of cornstarch with 1 TBSP water and add to the mixture to thicken. Remove lentil mushroom mixture from heat and stir in parsley and sherry vinegar. Transfer lentil and mushroom mixture to a lightly greased casserole dish and gently spoon potato parsnip mixture over the lentil mixture. Gently smooth out potato mixture so that the entire casserole is covered with the potato mixture. Cook dish at 450 degrees for 20-30 minutes, until potato topping is beginning to brown. Remove from oven and let stand for 15 minutes before serving. *Cast iron is great to use when you are trying to brown something. It aids in browning and also has the additional nutritional benefit of adding iron to your diet. I'm not kidding. That night was one of my favorite nights ever. Eating amazing shepherd’s pie in the dark with Kelli and Emma.